Felt is a strong and sturdy fabric but also a soft fabric. There are so many cute, cute felt patterns below including felt food and Christmas felt patterns. Felt can be used for almost anything! Slippers and baby shoes are also easy to make using felt fabric. 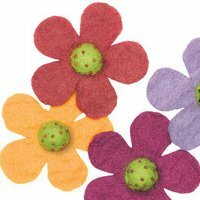 Enjoy looking through all the felt patterns below and sew one or several felt items for great gifts or to keep yourself. Some of the felt foods below are amazing - check them out!